On Tuesday, Jan. 28, 2014, the City of Beverly Hills turns 100 years old. The entire community is invited to a year-long celebration that includes exclusive offers, local events and community activities that pay tribute to the past, present and future of Beverly Hills. 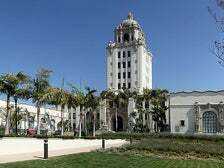 Commemorative items include a centennial pin; a centennial coffee mug; cookbook featuring Beverly Hills chefs; and In the Spirit of Beverly Hills, a look back at 100 years of the city’s history. Events and activities include the Arts of Palm installation, photography exhibit, tree planting, time capsule and much more. As part of the centennial celebration, several Beverly Hills hotels are participating in the Suite 100 program. Each hotel is featuring a redesigned suite that captures a time period from the last 100 years, with inspiration from celebrities, fashion and lifestyle trends. Rooms in the Suite 100 program are available for booking starting on Jan. 28, for stays from March 7 through December 2014. For more information on the Beverly Hills Centennial, call 310.285.1080. A complete schedule of events is available online: www.beverlyhills.org/exploring/centennialcelebration. Generations of filmmakers have featured Beverly Hills landmarks, restaurants and hotels in movies from classics to the latest blockbusters. Read on for some of the best movies that take place in Beverly Hills.